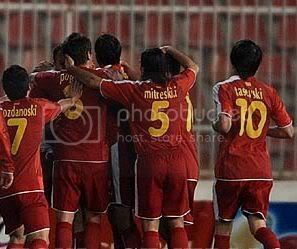 The Macedonian national football team started 2008 with a 1:1 draw on the friendly match against the 27th FIFA ranked team, the national team of the neighboring Serbia. Both teams started the match cautiously and after the first strength testing, Serbia took the initiative. After few not so dangerous chances on both side, Zigic had the most serious chance to score for Serbia, but his shot went wide from the goal. Macedonia had only few chances in the first half, but there was no serious and dangerous attempt on Serbian goal. Just before the end of the first half, Serbia took the lead when in the 44th minute Danko Lazovic scored with a good volley shot from 18 meters. In the second half Macedonia started more offensively and took the initiative. After one cross ball by Lazarevski from the right side, Serbian defence failed to clear the area and Nikolce Noveski didn’t had bigger problem to drive the ball in the net and make the final 1:1 result.